Jonathan Tropper’s novel The Book of Joe dazzled critics and readers alike with its heartfelt blend of humor and pathos. Now Tropper brings all that–and more–to an irresistible new novel. 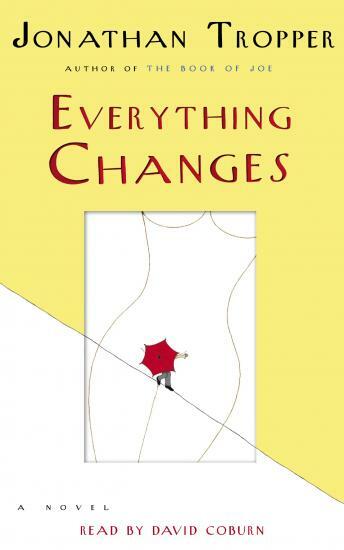 In Everything Changes, Tropper delivers a touching, wickedly funny new tale about love, loss, and the perils of a well-planned life. Then Norm–Zack’s freewheeling, Viagra-popping father–resurfaces after a twenty-year absence, looking to make amends. Norm’s overbearing, often outrageous efforts to reestablish ties with his sons infuriate Zack, and yet, despite twenty years of bad blood, he finds something compelling in his father’s maniacal determination to transform his own life. Inspired by Norm, Zack boldly attempts to make some changes of his own, and the results are instantly calamitous. Soon fists are flying, his love life is a shambles, and his once carefully structured existence is spinning hopelessly out of control.